Comments: Small black grains of qandilite in a forsterite skarn rock matrix. Location: Dupezeh Mt., Hero, Qala-Diz (Qala-Dizeh; Qala-Diza), Iraq. Scale: Picture Size 0.5 cm. Location: Forsterite-rich rock in contact with a kaersutite-rich banded diorite from the Qala-Dizeh region, NE Iraq. Scale: See Image. Comments: SEM image showing a blocky, stepped group of qaqarssukite-(Ce) crystals with several broken needles of strontianite. (CanMin, v44:1137). Location: Qaqarssuk complex, Greenland. Scale: See Image. Comments: Tabular crystals of quadratite with small silvery gray, rounded crystals of galena. Location: Lengenbach quarry, Binntal, Wallis (Valais), Switzerland. Scale: Picture size 0.8 mm. Comments: Aggregate of 3 black tabular crystals of quadratite (reflecting light) on jordanite/lengenbachite and white dolomite. Location: Lengenbach quarry, Binntal, Valais, Switzerland. Scale: Crystal size 0.2 mm. Comments: Colorless hexagonal crystals of quadridavyne. Location: Ettringer Bellerberg, Ettringen, near Mayen, Eifel Mts, Rhineland-Palatinate, Germany. Scale: Picture size 3 mm. Location: Rio Grande do Sul, Brazil. Scale: Sample size 20 cm. Location: Boldut mine, 61 level (350 meters deep), Cavnic, Maramures, Rumania. Scale: 5.5 x 3.5 cm. Comments: Black, prismatic ilvaite with quartz. Location: First Sovietskij mine, Dalnjegorsk, Russia. Scale: 3.5 x 4.5 cm. Comments: Crystal druse of transparent quartz crystals. Location: Hot Springs, Arkansas, USA. Scale: Specimen size 6 cm. Comments: White epistilbite cluster 25 mm across on amethyst quartz crystal matrix. Location: Sawda, Jalgaon, Maharashtra, India. Scale: 10x8x5 cm. Location: Lavra da Ilha, Taquaral, Minas Gerais, Brazil. Scale: 10 cm by 5.2 cm. Comments: White earthy queitite masses on quartz. Location: Tombstone, Cochise County, Arizona, USA. Scale: See Photo. Comments: Square crystal of quenselite on matrix. Location: Langban, Sweden. Scale: Crystal size 1 mm. 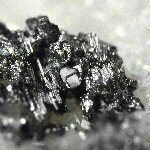 Comments: Jet black tabular crystals of quenselite, some striated on matrix. Location: Langban, Varmland, Sweden. Scale: Crystal size 1.75mm. Comments: White crystalline quenstedtite crust. Location: Richelsdorf, Hessen, Germany. Scale: See Photo. Comments: Pale brownish crystals of quintinite, 2H or 2T polytype unknown. Location: Jacupiranga Mine, São Paulo, Southeast Region, Brazil. Scale: Picture size 7 mm.